It’s about getting together, having fun, food, and enjoying each other’s company. A few weeks ago we took a road trip back to our hometown in Missouri. My husband and I both were raised there, met in high school, and we will be celebrating our 40th anniversary this summer. This trip was so my grandmother could meet her new great-great grandson and my husband’s mother could meet three of her new great grandchildren. One is our grandson from Texas, another baby is from California and one who lives locally. My mother-in-law wanted to be able to see them all together and everyone had a great time passing the babies around. This was truly a celebration. My mother-in-law has 8 great grandchildren and 7 grandchildren. My grandmother has 3 grandchildren, 5 great grandchildren and 3 great-great grandchildren. So there were plenty of hugs and kisses going around. My sister-in-law put up some tents in her backyard and had games for the kids to play. We did fajitas that night. One of my sons cooked and I helped with the stuffed grilled jalapenos, the guacamole, Mexican rice and the beans. So this may look like an ordinary styrofoam plate of Mexican fajitas but it was much much more. Everyone really enjoyed the food that night, being together, and meeting all the new babies. This is no ordinary plate of Mexican food! The next night we cooked at my twin sister’s house where we did bar-b-q ribs (while watching out for the tornadoes) and another night we got to feast on her homemade tamales and shrimp enchiladas. We have been sharing recipes for years and can never agree though on whose recipes are the best, but we have a good time trying different recipes. 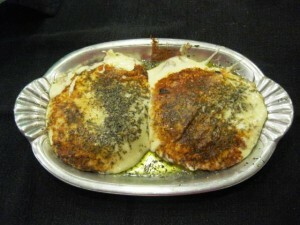 One night we tried this recipe for Grilled Provoleta. I do this a little different than most recipes. My recipe goes like this. Have some provolone cheese cut at 1″-1 1/4″ thick. Let the cheese stand at room temperature about an hour before cooking so it will dry out a little and develop a crust. This will keep it from melting so fast. I like doing the cheese over a charcoal or wood fire rather than a gas fire because the flavor is better. Before cooking coat the cheese with olive oil and press in dried and/or fresh oregano. Hey Sherry: Love, love, love looking at your recipes. I also cook all the time. I’ve used your cookbook for a number of years. Would love to share some of our Tn. recipes with you sometime. I think I do cook a little simpler than you cook. With 3 grown sons, 3 dnlaws, 6 grandchildren, there is always something on cooking around here.